Cut the cauliflower into tiny florets, and set aside. Take the remaining stalks and chop up. Place in a pot with the water, cream, and ginger root. Bring to a boil, and then simmer until the stalks are very tender. About 10 minutes. Allow mixture to cool. When the cauliflower mixture has cooled, put in a blender and puree until smooth. Dice the bell pepper into a small dice, and add to the crab meat. Using a vegetable peeler, prepare the asparagus by peeling down the stalk into thin strips. Add this to the crab, along with the reserved cauliflower. Mix in the vinegar and lemon zest, toss the salad to mix well. Pour half of the cauliflower cream into the crab mixture and mix well. Add more as needed to coat well. Adjust seasoning with salt and pepper. Allow to sit for 30 minutes before serving. 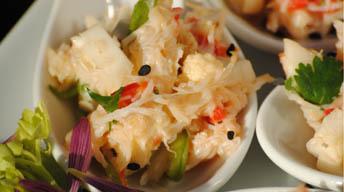 Serve the crab salad on the fried wontons. Or serve by itself in a bowl as a first course. Use the excess cauliflower cream on the plate if serving as a first course. Cut the wonton skins in half, resulting in 2 triangles. Heat vegetable oil in a small sauté pan. Fry the wontons in the oil, turning to brown each side. Make sure the oil is not too hot as they can burn easily. Remove and place on paper towels to drain excess oil.